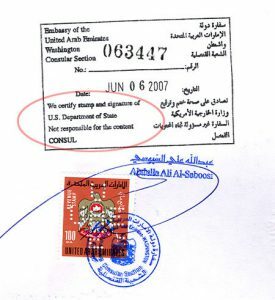 Embassy / Consulate legalization services are required for U.S. documents destined for use in one of the Non-Hague Countries. What is the meaning of “Non-Hague Countries”? The required certification depends on the destination country. Let’s say that you have a “Power of Attorney” issued in the State of “New Jersey” and you want to use it in “Egypt”. How to start legalizing your document? Hint: Other types of documents, such as Birth, death, marriage and divorce certificates do not require any notarization, however; It must be a certified copy recently issued by the Health Department in your State and bear the signature of the current State registrar. Contact your local Secretary of State office for document certification service. You should contact the SOS office in the same State, where the document is issued. The prices and turnaround times vary from a State to another. It is recommended that you call your local Secretary office before you go or send your document. The procedures, fees and turnaround time differ from one embassy to another. It is recommended that you contact the embassy directly for more information.